Why Did Matthew Write His Gospel? In a recent post on parables I quoted Michael Goulder’s recollections on why he came to the conclusion that the parables attributed to Jesus were really the literary creations of each of the gospel authors (evangelists). A few pages on in his memoirs, Five Stones and a Sling, Goulder further recalls what led him to believe other “sayings of Jesus” in the gospels were likewise the authors’ inventions. ‘Give not that which is holy to the dogs and cast not your pearls before swine’. Why did he write his Gospel? 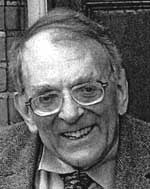 I had long ago heard it suggested that Matthew was attempting to write a Gospel that was in some sense modelled on the five books of Moses (the Pentateuch) but Goulder points out what most of us who have attempted to explore that particular pattern have surely come to suspect — that “the fit is not good”. The parables of Jesus are among many people’s favourite treasures in the Bible and the focus of much erudite and popular research outputs by some of the most renowned scholars in the field. 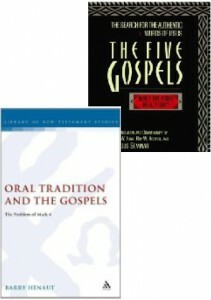 In The Five Gospels Robert Funk, Roy Hoover and the Jesus Seminar confidently point to the triadic structure (groups of threes) as well as the repetitions and catchwords — all characteristics of oral sayings — in the Parable of the Sower (Mark 4) to assert that this parable most likely originated as the very words of Jesus himself. 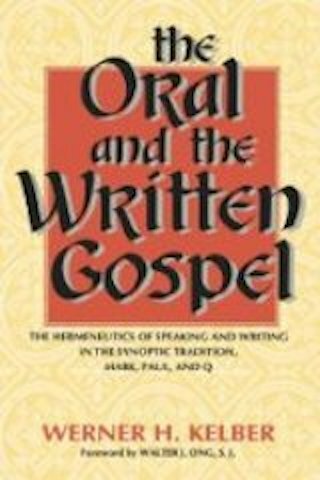 The same year (1993) saw Barry Henaut’s publication, Oral Tradition and the Gospels: The Problem of Mark 4, that comprehensively demolished the claim that triadic structures, repetitions and mnemonic catchwords are unique to oral communications and demonstrated that the same features were also characteristic of ancient literary compositions that were written to be read aloud to audiences. This post follows on from What Is a Parable? My original intent was to post the outline of Michael Goulder’s reasons for concluding that the parables we know so well from the gospels were the literary creations of the evangelist authors of those gospels and did not derive from anything Jesus said. Before I had a chance to continue with that plan one most helpful reader alerted me to John Drury’s book The Parables in the Gospels: History and Allegory. I’ll keep this post’s main focus on the Gospel of Mark, widely thought to be the earliest gospel written. Matthew, Luke and (a significant number of scholars believe) John knew and adapted Mark’s material to serve their own theological and literary purposes. I know we remember all this but. . .
From the earlier What Is a Parable? post we saw that the Greek word in the Bible that we translate as “parable” was derived from the Greek version of the Old Testament (the Septuagint/LXX) and embraced what in Hebrew was a word (mashal) that embraced a wide range of figurative expressions. It could be a pithy proverbial saying, an extended allegorical tale, a prophetic oracle, a riddle, a song of derision or a byword. It was generally a saying with a hidden meaning that needed to be deciphered. It generally professed to explain God’s will behind some historical condition. It was always an integral part of its surrounding narrative. 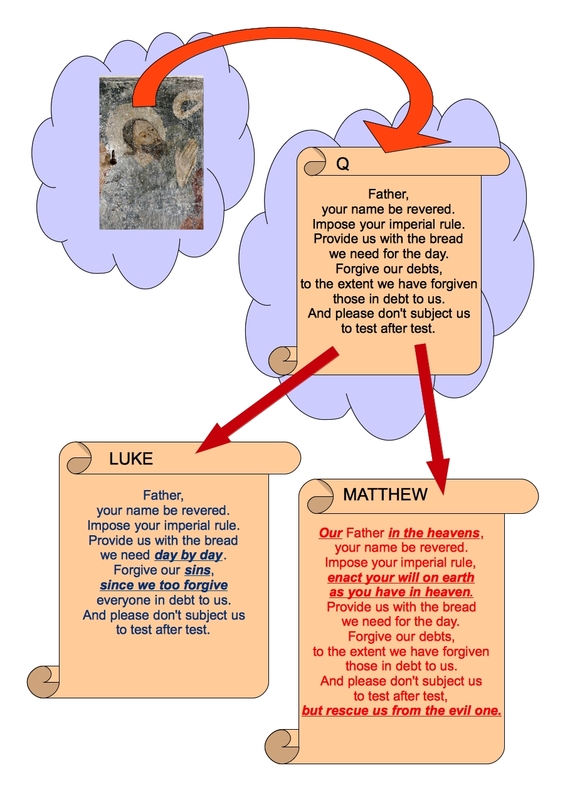 I compare here two explanations for the origin of the Lord’s Prayer as we read it today in the Gospels of Matthew (6:9-13) and Luke (11:2-4). For the first (that the prayer derives from Jesus, most likely as a collation of common themes in prayers he prayed over many different times) I use the explanations published by Funk, Hoover and the Jesus Seminar in The Five Gospels. 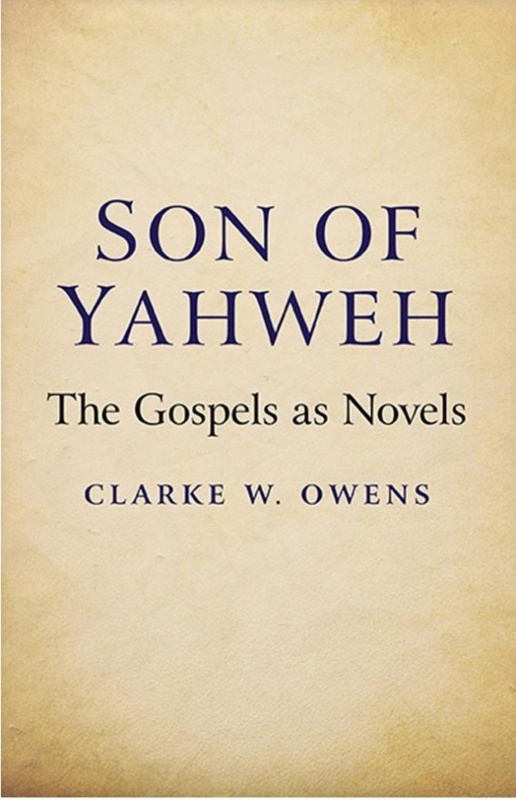 Though not agreed upon by all scholars in the details I think it does give a fair introduction to the general idea of how our canonical versions may have been adapted from the original teachings of Jesus. As for the second explanation (that the prayer was fundamentally the creative composition by one we shall call “Matthew”) I rely upon Michael Goulder’s ‘The Composition of the Lord’s Prayer’ (JTS 14 , pp. 32-45)*. Goulder also conceded that the original prayer came from Jesus but not as a direct instruction; he suggested that our Lord’s Prayer evolved from Jesus’ Gethsemane prayer for deliverance from the crucifixion. We will see that the details of his argument leave very little of the prayer that was not the creative work of an evangelist. Luke’s “day by day” is considered a departure from what Jesus would probably have originally said. Matthew got it right and Luke started to express worries about the day after this day and the next. This argument is based on our “knowing” that Jesus himself lived with complete trust in God for the needs of the present day (only). We “know” Jesus would have been directly mixing with people who faced dire poverty and were at the mercy of those who had money. It follows that Jesus originally prayed about real money debts. Matthew got this right, keeping to the original prayer as he would have found it, while Luke changed it to spiritual debts (sins). Twenty years ago the late Michael Goulder wrote an article in which he argued that Paul was the Fourth Gospel’s Beloved Disciple (“An Old Friend Incognito,” Scottish Journal of Theology, 1992, Vol. 45, pp. 487-513). It is no secret that the Fourth Gospel’s Jesus is very different from the Synoptic one. Goulder proposed that its Beloved Disciple too is a very different version of a disciple we all know and love: Paul. John was writing round the turn of the century, and had not known Paul personally. He did know at least some of the Pauline letters which we have; and he inferred from them, reasonably but erroneously, that Paul had been one of the Twelve Apostles. He also inferred from them that Paul had been present at the Last Supper, the Passion and the Resurrection. He found reason for thinking that Paul had been loved by Jesus; but his reconstruction was met with so much incredulity that he felt obliged to keep his hero incognito. (pp. 495-96). 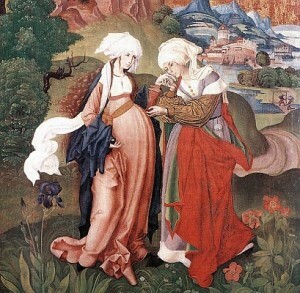 Thus, according to Goulder, it was a misunderstanding of certain Pauline passages that led the author of the Fourth Gospel to form a conception of Paul quite different from the one in the Acts of the Apostles. And he noted how easily one could have wrongly inferred from the words of 1 Corinthians 9:1 (“Am I not an apostle? Have I not seen Jesus our Lord?”) that Paul, like the other apostles, had met and received his call to apostleship from Jesus during the time of the Lord’s public ministry. McGrath compares Doherty’s use of the word “midrashic” with how a related word is apparently used by Barbara Thiering and John Shelby Spong. McGrath even links Thiering and Spong together as if they have a similar approach to New Testament studies. McGrath has the ignorance, the gallstones, the ignorance (one is not allowed to use a word that relates to “truth-telling” or “lying”) to compare Doherty’s — and now Spong’s too! — use of the word “midrash” to that of Barbara Thiering’s use of another word, pesher. It’s a pity Dr James McGrath was not sitting beside me when I attended a session where John Shelby Spong was the main speaker and at which he was asked about the works of Barbara Thiering. He would have learned that any similarity in thought between the two scholars could only come from the most creative cartoonists Hollywood has produced. It’s also a pity that Dr James McGrath has not had the time or interest to familiarize himself with any of Spong’s scholarly background or publications. If he ever does get the chance to do so he will learn that Spong is Michael Goulder’s successor of sorts, and is advancing Goulder’s arguments, with refinements more or less. (Has Dr McGrath even ever heard of Michael Goulder? One only has limited free time when one’s teaching curriculum requires so many hours of watching Dr Who! and contemplating each program’s “intersects” with religion). But back to this use of the word “midrashic” that McGrath takes such strong objection to. I have been posting on John Shelby Spong’s (and his late mentor Michael Goulder’s) understanding of how the Gospel narratives were created “midrashically” out of the Old Testament scriptures. I should emphasize that my posts come with my own slant, and that Spong himself has no doubts at all about the historicity of Jesus Christ. 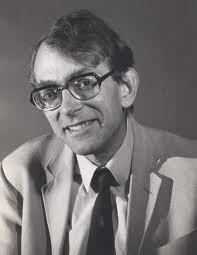 Spong argues that the Gospel authors were creating narratives to express their interpretations of Jesus. What this means is that someone like the original author of the Gospel of John created a Wisdom figure of Jesus to express what Jesus meant to him. That wisdom figure is a literary creation. I would say that any resemblance to a real historical figure is “imaginary,” meaning it is constructed entirely within the imagination of the reader/author and out of the materials found in the Old Testament (and sometimes other literature). A figure or event found in a literary text is surely a literary figure or event. Whether this literary person coincides with another real historical person is a question that must inevitably be decided on grounds other than the mere existence of the literary person in partisan texts. But our techniques for distinguishing who is historical and who is not and who might-be-sort-of when it comes to tales of King John, Robin Hood and Saint George seem to fly out the window when it comes to Bible stories. But a couple of Spong’s books did influence me some years back, so it’s time I caught up with sharing some of his own words in driving home some basic truths about the Bible. 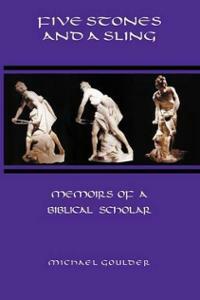 They are taken from pages 234 to 245 in Liberating the Gospels, with my own subheadings, formatting and emphasis.